How do you ensure that the perspectives of all families, as well as the perspectives of individual students, are incorporated into school and districtwide decisions? North Eugene High School, located in Eugene, Oregon, serves just over 800 students, with 59% identified as being socioeconomically disadvantaged, 7% in programming for English Learners, and 14% students with disabilities. The demographic profile reflects that 68% of the students are White; 20% Hispanic or Latino; 7% Multiracial; 2% Asian; 2% American Indian or Alaska Native; and 1% Black or African American. 4J school district is located in Eugene, Oregon, and consists of several regions, each with a high school and several feeder middle and elementary schools. Each region has their own unique characteristics, history, and demographics that impact the focus and reputation of the schools. As part of the 4J Vision 20/20 Plan, the district launched a regional visioning process, starting with the North Region of the District. The district wanted to identify what students, parents, staff, and community members believed was working well in the region, and what the desired future educational vision is for the region. The vision plan is intended to provide direction to the district as it seeks to improve programming and facilities in the North Region. What Did They Do to Address the Need? 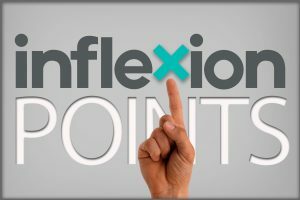 Inflexion consultants worked with the district team to help clarify the importance of a shared cultural identity and its role in the success of a school. Leaders saw the need to hear the true beliefs and values of the community. The visioning process involved three phases. This first phase consisted of conducting a survey targeting key stakeholder groups in the North Region of the District. The survey focused on identifying current strengths and desired changes in all of the public schools of the North Region, as well as suggestions about how the schools should move forward to better serve students. The key stakeholder groups include students, parents, staff, and community members. The results of the survey were used to inform the subsequent phases of work. Phase two involved a strategic visioning process. This visioning process included extensive community engagement from stakeholders including students, parents, school staff, and community members. Stakeholders worked in small groups to define the outcomes they want for the students of their community, the characteristics of their ideal school environment, and the personality traits they would use to describe their school/community. These sessions were designed to allow stakeholders to collectively identify and articulate the values, beliefs, and priorities of the North Region, as well as the specific challenges that the region is currently facing. This proved to be a valuable source of information that shaped the approach the leadership team would take moving forward. For the last phase, Inflexion consultants developed Life Ready Maxims that the North Region can use every period, every day, so that both teachers and students can draw clear connections between all that they are learning and teaching. In addition, they created an awareness campaign to raise community awareness about the North Region Vision. As a result of the community listening sessions, the district and school leadership heard first-hand the expectations and values from a sampling of students and parents and began to establish a personal connection with them. 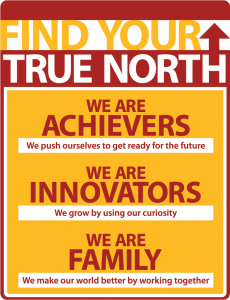 Using their tagline “Find Your True North” and their maxims, the North Region will begin to promote the shared values to the community by displaying them on printed materials, branding visuals, and on-site displays. The goal is that no matter what students are doing throughout their school day, whether it is a math class or an after school club, they can identify and articulate how they are using and exemplifying the maxims. Ideally, they would even start to see the connections to what they do outside of their school day. What Are Life Ready Maxims? Life Ready Maxims are statements that act as a school’s core drivers to equip and empower every student to pursue their, passion, interests, and aspirations. They are used to highlight the areas of hidden strength already within a school. They can also be used as aspirational statements to reinforce the promises your school makes to the community. Maxims should be displayed widely and built into the daily curriculum, as a whole or in part, to familiarize your students and staff with them and embed them into the school culture.